from family, friends, and hopefully with a loving caring life-partner, too. Firstly, though, we need to love, accept and value ourselves. Once we have learned to do so we are open to forming lasting, strong and loving relationships with others. We are also ready to be united with our soulmates. but also a deep understanding of each other's thoughts and feelings - a best friend, too. and to open a space in our hearts in readiness to be united with our twin-flames. Scroll down to find the Prayer for Love and Contentment and the Soulmate Blessing, further down the page. There are 7 Affirmations of Love for you to use - one for every day of the week. Say the affirmations out loud, preferably whilst looking in a mirror, and BELIEVE that it is so. 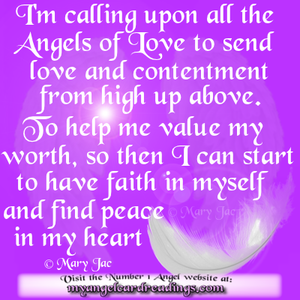 You'll also discover here which Archangel to call on to help you with love and relationships, also with finding your Soulmate. which you can recite each night if you wish to. 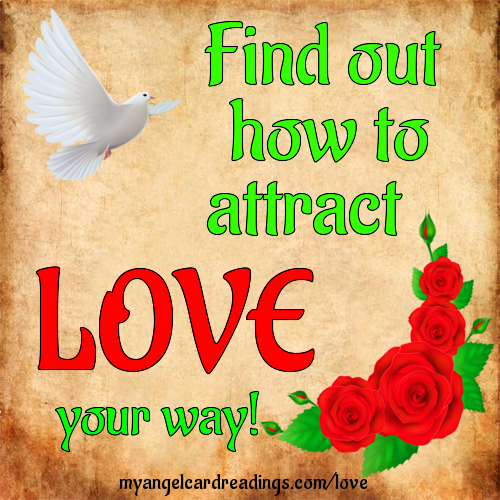 self-love, and attracting love into your home, too. "I truly and deeply love and accept myself"
and deserve all good things in my life"
and am really proud of that!" for knowing my true worth"
relationship as anyone else in this world." "I know that contentment will soon be mine." "I am open and ready for true love to enter my life now." 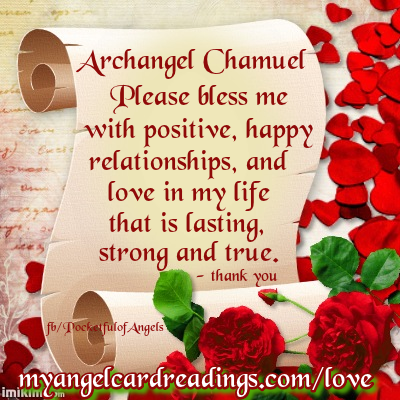 Archangel Chamuel is the Angel of love - Chamuel can help us to heal a broken heart and find the love deep within us so that we can learn to value and love ourselves, as we all should. 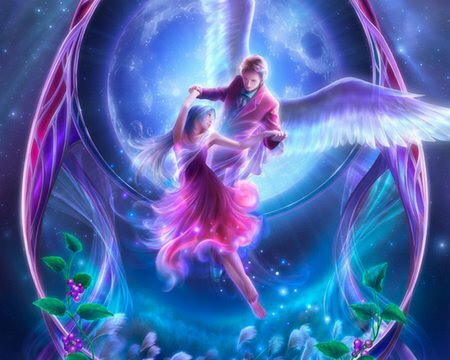 He works with us on our relationships to build and strengthen them, and loves to unite us all with our life soulmates so that we can find true love and contentment. 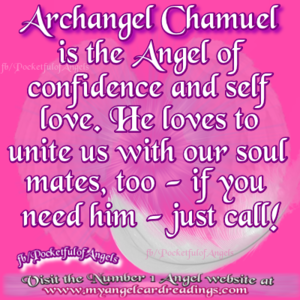 and find out about how the other Archangels can help you, too. Created by Mary Jac with the aim of attracting love & romance, and promoting self-love too, encompassing a peaceful happy heart. 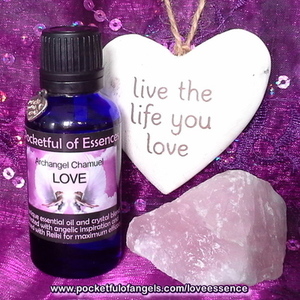 Inspired by Archangel Chamuel, this essence has been lovingly created with the aim of attracting love & romance into our lives. You will find lots more information and purchasing details by going to the link below where you'll discover that every ingredient used brings its own particular loving energy to this angelically inspired and romantic blend. 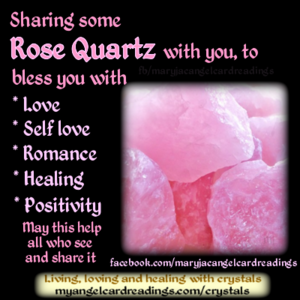 The best known love crystal is rose quartz. The stone of unconditional love - it's a loving, soothing stone, with a gentle energy that helps you to love and accept yourself. Wearing a small piece on a necklace, close to the heart, helps to dissolve blockages that prevent you from being open to loving yourself and others. Placing a large chunk in your home (preferably in view of the front door) will encourage a peaceful loving atmosphere, and attract loving relationships towards you, too. Take a look at the 'Living, loving and healing with crystals' page to discover more crystals that are said to heal the heart, attract a soulmate and more. 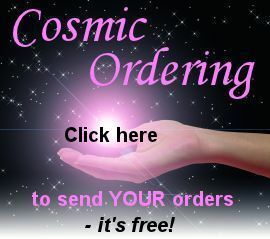 or to send your 'love orders' out to the Cosmos, please click on the images below - it's all free for you to do!